As the days darken, a clown haunts every gloomy corner of the UK. After a long hot summer of creepy clowns in America Britain is in the grip of a full-blown panic over people dressed as ‘Killer Clowns’. In the midst of the panic, scare stories and thick media coverage the public concern and interest in these clowns has met with an older narrative – one lifted from urban legend. The creepy clown craze began in the United Kingdom in 2013. Northampton student Alex Powell claimed he was attempting to ‘amuse’ his neighbourhood by dressing up as Pennywise, the clown from Stephen King’s 1986 novel and 1990 television adaptation It. “Most people enjoy being a bit freaked out,” he said, “they laugh about it afterwards.” He was outed as the clown by the Daily Mirror on 13 October. There was another killer clown arrested in September 2013, just before Alex Powell started his creepy clowning. He was arrested in Carrickfergus, County Antrim, after standing outside school gate with a balloon and a balaclava-wearing accomplice. “The aim was for a bit of fun. I'm a parent myself” said the self-styled Carrick Killer Clown. A year later an 18-year-old woman was arrested after approaching school children while dressed as a clown in Tonbridge and Tunbridge Wells. Atlas Obscura has an interactive map of this year’s clown sightings in America, while UK reports number in hundreds. Each story involves a clown, or a group of clowns, carrying a knife and giving chase. They rarely catch people but their victims are often children who are terrified by their encounter. No one has been hurt from an encounter with a clown. A rare clown arrest was that of a chainsaw-wielding clown arrested on Brunel University campus on 10 October. He was a media student making a video and apologised for scaring people. Two Killer Clowns arrested in Westfield Shopping Centre in west London on 17 October were carrying a rubber machete and filming. The fad is much more a Halloween game than any sort of looming violence. The Killer Clowns have not harmed anyone in the UK or USA. The recent stabbing of a teenager in Sweden and violence in France in 2014 when a man was attacked with an iron bar in Montpellier are rare exceptions. But they are still frightening. The charity ChildLine has reported a deluge of calls from children about creepy clowns. As well as straight reports in the local and national press there has been condemnation from professional clowns against the grungy street clowns, reports on the effects of the craze on fancy dress shops and a guide to talking to children about creepy clowns. “I’m coming to your school on Friday when a gang of 20 more clowns and we’re going to hide in the bushes near wear the AEC is and at the back off the car park in the trees. “We’re coming for you, wach out and don’t get the 73 bus because we’re going to be waiting as Sainsbury’s and in the side alleyway we’re I’ve seen kids messing about with trollies and silly string. Beneath the news stories and hoaxes another narrative has taken hold amongst the people most concerned by the antics of the Killer Clowns. Children have weaved, or adopted, their own narrative about the dangers the clowns bring. On 13 October children at a school in Brockley, south London, were telling a tale of killer clowns planning to roam the streets at Halloween attacking children. These clowns were coming from America to the borough of Lewisham, in keeping with the current misperception that the Killer Clown craze originated in America. Another rumour said they would gather at Hilly Fields, a local park, on Halloween and would attack anyone foolish enough to go there. This slip from moral panic to scare stories fascinated me. I spent the weekend asking teachers and parents if they had heard of stories about the planned clown attacks. I heard that a six-year old child in Lewisham had brought a weapon to school protect himself from the clowns. And schools in Lewisham and Southwark have sent children home with letters from the police telling parents to dial 999 if they see a larking clown. This follows a report of two school girls being chased by a man with a knife dressed as a clown in Lewisham park Manor House Gardens. On Wednesday 5 October Clacton High School in Essex kept all 1600 students in over a lunch break after two female students reported being approached by men in clown masks driving a black van who asked them if they wanted to go to a birthday party at 9.20am. In Northern Ireland three schools were closed for fear of clowns arriving when students left. Armed police guarding two Ballymoney schools. No clowns came but days earlier teenagers dressed as clowns were seen with a knife in a local park. The deputy head teacher of Trinity School in Newbury sent a letter to parents warning them of a possible attack on children when at Newbury’s Michaelmas Fair. In Hinckley and Bosworth in Devon “scores of people took to Facebook and Twitter over the past week to warn that the masked pranksters will be targeting schools in the borough” on Friday 14 October. 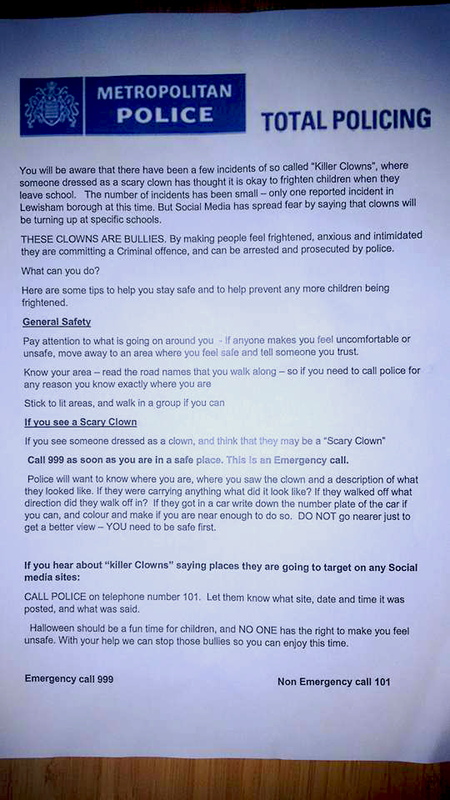 Heath Lane Academy in Earl Shilton used Facebook on Wednesday 12 October to ‘dispel myths about the school being on ‘lockdown’’ from a rumoured clown attack. The clown panic has merged with the plot of the Purge film series. This suggests that there is an evil clown plot behind these sightings. A plot that is building to a greater horror at Halloween. The rumour does not explain who the clowns are purging or what they hope to gain by this Halloween pogrom. They are removed entirely from understandable human motivations. This fear is also feeding into the playground stories. Something can be learned from looking at previous moral panics about anonymous street violence. The pattern is similar to our present killer clown panic. Just as Instagram has spread the fear of Killer Clowns by people who were not dressing up as clowns, Twitter was used in 2011 to make threats and reports of riots by people who were not anywhere near a riot. Beneath the palpable violence of the August 2011 riots was another threat. On the night of the riots false reports emerged of Camden being laid waste and the venue the Electric Ballroom being burnt down. Twitter told one blogger that The Glade shopping centre in Bromley was on fire. There were “shocking” scenes as it was “all kicking off”. The rumour that the West End would be targeted next; one rioter had shouted the plan out during the violence in Peckham and the idea spread, again, over the internet. The arrival of rioters was threatened like the clowns and people enjoyed spreading false information. In the late 1980s the folk-devils were not loners and media students dressed up as clowns but skinheads and football hooligans. This was a time of fierce soccer violence and from the reputation of one team’s fans rose the story of the Chelsea Smilers. The Smilers started their life travelling London in a van, stopping school children to ask them questions about Chelsea Football Club. If the children got the questions wrong the gang would give them a “Chelsea smile”. The children would be sliced at each corners of their mouth with a razor blade, knife or credit card or phone card. The gang would then hit the child hard enough to make them scream which would widen their wounds into a “smile”. The wound was seasoned with salt or vinegar. The story always ended with a warning much like the clown warning: the Chelsea Smilers were at another school yesterday but they were coming to the child’s school today. Having school age family at the time of the panic enabled Roud to trace Smiler stories from his daughter’s school in Croydon in January/February 1989 to a possible origin in Bexley from around 31 January 1989. From there it spread across south London, reaching Wandsworth, Merton and Sutton by the first week in March and hitting Kent and Surrey soon afterwards. He reported that the panic died down quickly but the story became a standard playground scare story. However, the rumours migrated to northern England and by November 2001 the Salford Inspection and Advisory Service sent a circular to local schools. An even more sinister, and racist, version emerged in post-9/11 Netherlands where the Smiley Gang were a group of young Moroccan migrants. From 2003 the stories claimed they would target 16-20-year-old women and ask if they would rather be raped or receive a smiley for the rest of her life? The victim would choose the “smiley” and be cut as per the English version of the legend. The Smilers then appeared in Belgium where Flemish youth feared attacks by Moroccan teenagers while Moroccan girls thought Flemish teens would attack them. In Spain the story called the wound the “Clown’s Smile” (Sonrisa del Payaso) from 2001 onwards. The gang is often thought to be either neo-Nazis or a street-gang known as the Latin Kings. In Scotland in September / October 1991, the men cutting your face were clowns. Five years later Steve Roud quotes a letter from a Glasgow parent remembering his then six-year-old son’s memory of them. “Sometime around 1991 when I would have been 9, There were rumours of men going around Glasgow & Lanarkshire (Where I lived) in transit vans dressed as clowns. The story goes that these guys were escaped psychopaths from Carstairs Hospital hell bent on disfiguring and murdering children in the area. Our Killer Clown stories may not have a direct link to the Chelsea Smilers and their clown kin from Glasgow. When a perceived danger is as widespread as this current panic it possesses the popular imagination and without a firm story (lots of sightings, lots of chasing) people will forge a hook to hang their fear. A story is the best way of framing a fear – this is where urban legends emerge and re-emerge. They are simple stories: the core story of the Chelsea Smilers is ready-made and easily adaptable to new social conversations on societal fears from migrants to killer clowns. Vernacular narrative, particularly scare stories, has a way of weaving in and out of conversations over decades. A fear needs to be expressed and a story expresses it well and so a dimly remembered story of dangerous strangers of previous decades can be repurposed in 2016. In reality the Killer Clowns are on foot, occasionally on a bicycle. In the hysterical folklore of the clowns they travel in vans, perhaps a detail held over from the Smilers and Glaswegian Killer Clowns. London has had previous boogie-men; the most celebrated being the figure known as Spring-heeled Jack. Now regarded as part folk hero, part monster Jack entered the public consciousness in 1838 as a character disguised, or could take the form of, “a ghost, a bear and a devil” that lurked London’s suburbs terrifying people. A narrative quickly formed about him; according to a letter in The Times dated 9 January 1838 Jack was a lunatic who had accepted a bet place by several wealthy and jaded men that he could succeed “in depriving seven ladies of their senses”. Two had already been frightened witless by him. Five remained. Running parallel to the rumour of Spring-heeled Jack were actual encounters with men dressed up and attacking people – often women. The Times reported on 22 February 1838 that Jane Alsop of Bearbinder Lane, Old Ford answered the door to a man who asked for a light as they had cornered Spring-heeled Jack. When she returned with a candle the figure threw back his heavy cloak and “vomited forth a quantity of blue and white flames from his mouth” at Alsop. He then leapt at her and tore at her dress while she was in a headlock. The arrival of her sister saved her. The sexual motivations of the attack are clear. Spring-heeled Jack was seen all across London during February 1838 and it was clear that there were many men out at night in disguise and looking to frighten people or worse. A similar case was of the Peckham Ghost of 1872. Further back in the past were the phantom menace of the Mohawks. The Mohawk panic took place in 1782 and also expressed concern over the cruel tricks of idle men. After drinking in their Mayfair club the Mohawks would wander through London with specially made torture implements for over-turning carriages, crushing noses, gouging eyes and hooking people with fish hooks for their amusement. Women would stay indoor as, again, the Mohawks targeted women and, like Spring-heeled Jack and the Killer Clowns countless words were written about them in newspapers, pamphlets and broadside ballads. With a lot of rumour and little evidence the doubts about Mohawk stories grew. Jonathan Swift thought the Mohawks were mass hysteria and Daniel Defoe suggested that they had the “air of Grub Street” about them. The Killer Clown myths we began with are still relatively new and the rumours and fears that have been reported and I have collected are, at present, thin and unformed. As we build to Halloween, and if the Killer Clown fad continues, our stories will solidify into a tale like the incarnations of the Chelsea Smiler story. There will be moralising, possibly implying that the attacks are a punishment for gluttony during Trick or Treating or enjoying oneself too much at Halloween. I half-expect the clowns to be handing out another popular Halloween scare – the apple with a hidden razor blade planted in it. If not a punishment, then a folk-devil du jour will be hiding beneath the clown make-up. They will be migrants, criminals, terrorists or perhaps paedophiles. Contemporary folk stories exist either as a judgement on a group of people or a warning to them. They also create the illusion of control over those who would do us harm. If we know how and where they will attack, we can avoid or prevent it. In a world that contains a great deal of random ugliness, these stories offer us a chance we don’t often get: to be warned of the horrors coming towards us and prepare against the harm that they bring.